Compact little plants whose small flowers have whiskered markings resembgling little faces. Colours include violet-purple, mauve, lavender-blue, lilac-pink, bronze and creamy-white, combined with yellow or golden centres. Height 15-20cm (6-8"). HHA, HB or HP - Half hardy annual, Hardy biennial or Hardy perennial. Note: Flowers are edible and ideal in salads. Flowers with lovely little faces! 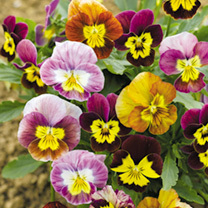 Sow February-April indoors to flower May-September; or June-July for March-May the following year. Suggested planting distance 15cm (6"). Ideal for beds and borders, patio pots and containers, hanging baskets. Prefers full sun or partial shade. Remove dead flowers to encourage new ones.